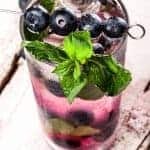 Place the blueberries in the bottom of a cocktail shaker and top with the basil and mint leaves. Muddle gently. Add the lime juice, rum and simple syrup and shake vigorously. Strain into an ice-filled highball glass and top with club soda. Garnish with skewered blueberries and a sprig of basil.